Il a servi dans la Royal Air Force britannique de 1929 à 1937. Un total de 443 véhicules ont été construits. Good turn rate. Easy to use and can be very versitile. Has the firepower to stay in a fight. The design of the Bulldog was the outcome of a series of design studies for fighter undertaken by Frank Barnwell during the 1920s. 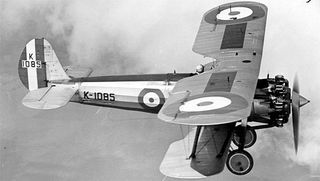 In 1924 Barnwell had started work on a fighter powered by the Rolls-Royce Falcon to meet the requirements of specification F.17/24. The project was shelved since Bristol preferred to use their own engine designs, but was revived in 1926 when Barnwell started work on a gTdesign, designated the Bristol 102, to meet either F.9/26 for a day and night fighter or N.21/26 for a shipborne fighter. The Type 105 designation was first applied to a subsequent proposal for another aircraft to meet F.9/26 powered by the IMercury engine then under development at Bristol. These proposals looked promising enough for a pair of mock-ups to be constructed for inspection by the Air Ministry in February 1927. The two aircraft were similar in design, the interceptor to specification F.17/24 design being slightly smaller and lighter and not equipped with radio. As a result Bristol were asked to revise the design so that it met a later interceptor specification, F.20/27. Subsequently, a prototype aircraft, now designated the Type 107 Bullpup was ordered for evaluation, but the other design did not gain official backing. Nevertheless Bristol considered it promising enough to build a prototype to be entered for the F.9/26 trials as a private venture, powered by a Bristol Jupiter because the supply of Mercurys was expected to be limited. The Type 105 was an unequal span single bay biplane powered by a supercharged Bristol Jupiter VII air-cooled radial engine driving a two-bladed propeller. The structure was all-metal with a fabric covering, using members built up from rolled high-tensile steel strips riveted together. In order to ensure the maximum field of view there was a large semi-circular cutout in the trailing edge of the upper wing and the inboard section of the lower was of reduced chord. Frise ailerons were fitted to the top wing only. It was armed with a pair of 0.303 in (7.7 mm) Vickers machine guns mounted either side of the cockpit. The prototype Bulldog first flew on 17 May 1927. Initial testing was entirely satisfactory and it was delivered to RAF Martlesham Heath in June. After initial consideration of all the types entered to meet the specification, the Bulldog and the Hawker Hawfinch were selected for more detailed evaluation. While the Bulldog's manoeuvrability and strength were praised by the RAF, it had poor spinning recovery properties. This was solved by fitting an enlarged fin and rudder, but this modification led to difficulties in taxying cross-wind. Accordingly, a second prototype with a lengthened rear fuselage was ordered for further evaluation in comparison with the Hawfinch. In this form, designated the Type 105A or Bulldog Mk. II was first flown by Cyril Uwins on 21 January 1928 and shortly afterward, delivered to Martlesham Heath. Performance was so close to that of the Hawfinch that a decision was deferred until the aircraft had been evaluated by service pilots; the eventual choice of the Bulldog was made largely because it was easier to maintain. An initial contract for 25 aircraft was placed: Bristol accordingly laid down 26 airframes, the additional example being intended as a company demonstration aircraft. The first of these were delivered on 8 May 1929 and deliveries were complete by 10 October. Later production aircraft were of a refined version designated the Mk. IIA. This had revised wing spars and a stronger fuselage and was powered by the uprated Jupiter VII F. One production aircraft was modified for use as an advanced trainer: after evaluation by the Central Flying School at Upavon this was ordered by the RAF, the production aircraft differing from the prototype in having slightly swept wings and an enlarged fin to improve spin recovery characteristics. The Bulldog never saw combat with the RAF, although during the Abyssinia Crisis of 1935–36, Bristol Bulldogs were sent to the Sudan to reinforce Middle East Command. Douglas Bader, better known for his Second World War actions, lost both of his legs when his Bristol Bulldog crashed while he was performing unauthorised Aerobatics at Woodley airfield near Reading. The Bulldog was withdrawn from RAF Fighter Command in July 1937, being primarily replaced by the Gloster Gauntlet. The Bulldog's RAF career was not over though, for the type continued to serve for a few years with Service Flying Training Schools. The Bulldog proved to be quite a successful export to foreign air forces, seeing service with Australia, Denmark, Estonia, Finland, Japan, Latvia, Siam and Sweden. In 1936, Latvia, keen to replace its elderly Bulldogs with more modern aircraft, sold 11 Bulldogs to Basque nationalist forces; becoming part of the Spanish Republican Air Force in the Spanish Civil War, they remained in use until the Battle of Santander. Ten Bulldogs also saw combat as part of the Finnish Air Force during the Winter War against the Soviet Union, which began in 1939. The Bulldogs fought well against their Soviet opponent, gaining six kills by five pilots for the loss of one of their own, the types shot down being two Polikarpov I-16s and four Tupolev SBs, both of which were superior in terms of technology compared to the Bulldog. The first aerial victory of the Finnish Air Force was achieved by a Bulldog piloted by SSgt Toivo Uuttu on 1 December 1939, over an I-16. The Bulldogs were used in advanced training during the subsequent Continuation War against the Soviet Union.